Dealing with large volumes of hydrocarbons is always risky: there can be leaks to the environment. When a hydrocarbon leak reaches groundwater, it migrate fast, affecting vast area and becoming a large environmental problem that will definitely have consequences. That’s why an early detection is so important. There are numerous leak detection systems in the market: statistical inventory reconciliation (SIR), interstitial pressure measurement, watertightness tests… all those methods have a “shadow zone”, quantity of hydrocarbons that can be leaking without being detected, that is calculated to be around 0,4 Liters per hour; that makes around 3.000 Liters a year affecting the environmental. If we take in consideration that 1 Liter of gasoline can contaminate 1.000 Liters of water we will understand how big the problem is. Because of that, groundwater monitoring will be a safe practice helping to avoid enormous environmental issues in any facility dealing with large amounts of hydrocarbons. The Spanish based company Smart Sensor Technology has developed a revolutionary Leak Detection System to be placed in monitoring wells that, complementing existing systems as SIR, will stop the problems that players in the hydrocarbon logistics sector (refining, storage, transport and retail) are facing, allowing them to focus on their core business being safe that leaks won’t affect the environment. Smart Sensor Technology acknowledges the enormous body of work that takes the periodic manual monitorization of monitoring wells: every 3 or 6 months a group of workers needs to go to the field to take samples of groundwater, sometimes they will find that the monitoring well is clean, so they have travelled for nothing, some other times they will find a layer of hydrocarbon floating over groundwater, so they will have arrived late. In both cases the operative is so inefficient. That’s why SST had put effort in developing a system that allows to continuously and remotely monitor the groundwater and detects any leak as soon as it reaches the groundwater, activating an alarm. That way the user can get “peace of mind” that his activity is not affecting the environment and can focus on the core business. The system consists in a sensor that floats in the groundwater of the monitoring well and is activated, due a physical chemical reaction in its internal cartridge, in presence of free phase hydrocarbon (gasoline, diesel, jet fuel…). 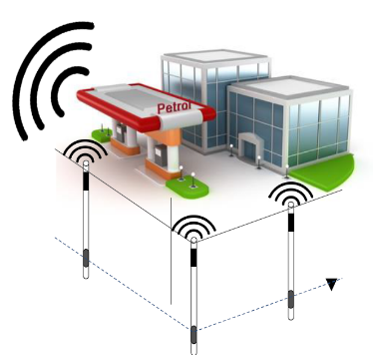 The sensor is connected to a radiofrequency transmitter, that is placed on top of the monitoring well, and reads and sends wirelessly the sensor information to the gateway, where is managed and alarms got activated if a leak happens. The system is easily installed in 10 minutes with no civil work and has battery to operate during 7 years with any kind of maintenance. Smart Sensor Technology’s Leak Detection System for monitoring wells allows continuous, remote, and wireless monitoring of groundwater of any facility overcoming the limitations that present already existing systems in the market: the need of maintenance and the frequent false alarms. Existing systems need maintenance, what makes operative inefficient and makes it still look so much like manual monitoring, since it still makes a worker to move to travel to the location to make the work needed. SST has developed a robust system that can monitor, continuously and without any kind of maintenance, the groundwater of any facility during 7 years. The sensor has an internal replaceable cartridge that, due to a physical chemical reaction, gets degraded in presence of free phase hydrocarbon. The cartridge is the only part of the system that needs to be changed if a leak is detected, once the system has a new cartridge is ready to keep monitoring. Is precisely the physical chemical reaction that happens in the internal cartridge of the sensor what helps to avoid the second major problem on existing systems: false alarms. The internal cartridge is sensible to the presence of hydrocarbon, and gets degraded on their presence. So if the sensor detects a leak we can be sure that it happened. Besides that, the cartridge saves a sample of the hydrocarbon present in the groundwater as an evidence. With that we can be sure that there are no false alarms not false negatives. -Local alarms: the gateway has a LED and a buzzer that will get activated once one of the sensors has detected a leak. Besides, the gateway has a LCD display that will show the name of the specific monitoring well affected by the leak. It also has Relay NO/NC outputs, so it can communicate with already existing consoles. -Remote alarms: the SmartGate has a GPRS/ethernet module, that allows it to connect to internet and send remote alarms. When a leak is detected the gateway will send an alarm email to the person/persons in charge of the facilities. It can also upload data to the SST cloud server where the client will access to a data visualization application with a name and password (or upload data to the client’s server). With the new Smart Sensor technology’s Hydrocarbon Leak Detection System for monitoring wells, the players in the hydrocarbon storage, transport, and retail sector can concentrate in their core activity with the “peace of mind” that they are not affecting the environment.